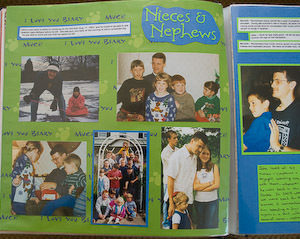 This memories scrapbook was one of the most complex that I did after my husband died. Yet I think it will be one that my son will look through the most, to get an understanding of his dad. To create this book, I emailed all my husband's family and friends and asked them to think over their favorite memories of John. They were free to contribute as much or as little as they wanted. Some people wrote a few lines telling how much John meant to them. Others wrote letters to my son telling him humorous stories from college years. One friend of my husband's wrote pages and sent a stack of photos detailing a road trip they made from Pennsylvania to Honduras. Every contribution was a wonderful addition making for a very full book! For this scrapbook, I chose 12 inch square pages. The large size was nice to create a collage effect of stories and photos from the difference seasons of my husband's life. For the most part I tried to keep it close to chronological order. Baby years through preschool stories followed by elementary years and so forth. If people had handwritten their responses, I cut their stories out to fit with the photos on the pages. If they emailed them, I would see what size and spacing would fit best and print it out accordingly. John's mother did a good job of coming up with stories to go with so many of the early photos. Various people had collected tributes that people wrote in the early days following John's death. I included these together at the end of the book. The most important thing to remember if you attempt a scrapbook like this is take it a little bit at a time. Four years later, this is the one book I've done that still doesn't feel finished. And maybe it never will be. I always keep hearing stories that I hadn't heard before.